The painting “Sadko” Repin wrote in 1876, while in Paris. But in France, Russian folk motifs of the canvas were not appreciated. But in the homeland of the artist his work immediately received the highest rating. The painting was purchased for his collection by Alexander the Third, the future emperor. Repin himself for his skill was awarded the title of academician. The author was inspired to create a picture by a popular bylina about Sadko, a Novgorod merchant famous for his playing the harp. Once Sadko was visiting the king of the sea. The submarine ruler liked the musician’s game so much that he decided to keep Sadko with himself. For this, the king is ready to give the merchant a wife any of his daughters. This moment is depicted on the canvas. By the epic hero swim beautiful women princess. The artist dressed them in rich national costumes. But they are not interested in Sadko at all; he is looking at a simple girl, Chernavka, standing in the background. As we know from the epic, such a choice of a wife saves his life and freedom. The painting “Sadko” is distinguished by its depth. She is shown with a string of sea princesses passing by the hero. The girls in the foreground are drawn quite clearly and in detail, you can easily consider the features of their faces and the details of clothing. The figures in the background are blurred, the end of this building of brides is lost somewhere in the depth, it is not visible because of the water column. With amazing skill and meticulous traced sea water. 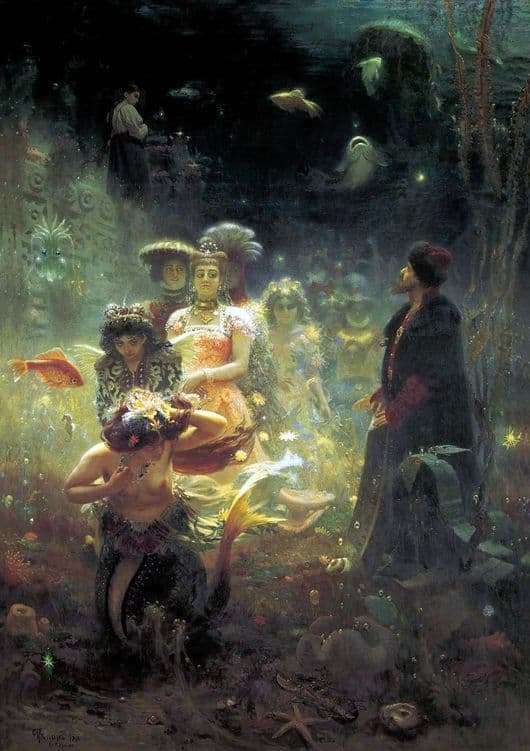 To achieve maximum realism, Repin visits the aquarium, which recently opened in Berlin. The artist uses a variety of shades of green – from light green to rich malachite, almost black. Repin managed to show the fantastic nature of the underwater world, its unearthly beauty. On the canvas, we see the diverse inhabitants of the depths of the sea: starfish, fancy fish, corals and algae.